If you have an Android you can locate your phone anytime from a computer or view your location history based on date. Check the mapped history of where your phone has been base don date. If you need to enable to disable, this is how. You’re probably here because you lost your phone or someone may have stolen it and that link helped you find it. If the link did not work it could be because your phone is off or not connected to the internet. The only thing you can do is hope or keep trying. With the Google Device Manger you can remotely lock the phone, change the password, make the phone ring and even erase all of the data by simply logging into your Google Account Manager. I myself lose my phone at home sometimes and have to use the Android Device Manger to make my phone ring in my own home. It works great and it’s easier than having someone call your phone for you. Because so many people are looking for this info, the answer is no, you can not remotely enable the location services. If you did not do this when you got your phone, then you are too late. Your phone is gone. There is an app out there that claims to do it, but it does not. I have tried it. The only possible option is if you have a Samsung phone, you can try their remote location service. I do not know if this works because I have a Moto G 5 Plus. If you did enable your remote location services, when I locate it on the map it goes straight down to my house on the map every time. It almost makes me want to lose it so I can hunt it down. Now it’s only accurate to 30 meters but I can tell it’s even better than that. It’s like on my bedroom when I look. 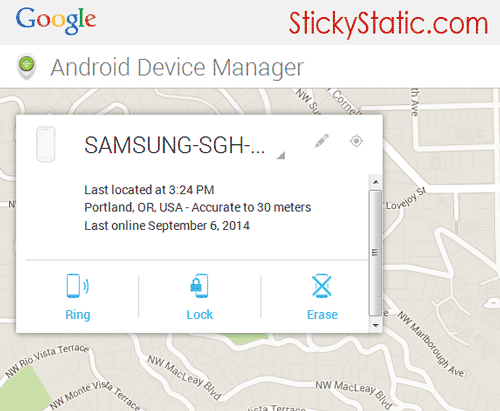 So now we know if you lose your Android or your Samsung gets stolen you can indeed track the phone down with the provided Google Android Device Manager tool. In order for this phone tracker to work you will need to have signed in your Android Phone with your Google Account but you pretty much have to and likely already did at some point. One thing that the Google Account Manger does lack is the ability to take a photo with your device remotely and upload it to the cloud. But I’ll teach you how down the line here. This exact feature on Apple has recently caused a major uproar with a few famous celebrity iCloud accounts being hacked and their indecent photos being spread around the internet but I myself would like the ability to sync my photos online in case my phone is stolen. Google says they are working on this. Just to be sure phone tracking is on for your phone you can check by following these steps. Or you can turn it off. Go to Settings > Accounts > Google > Location Settings and Location Access. It should be on by default but you would hate to find out you turned it off(like I did) and then lost your phone or needed to recover your stolen phone. You may also be prompted to enable your location services so that it can actually track your phone with your permission. You may worry that the GPS Tracking and Wireless Network Access will drain your battery but I find that it does not and only enables itself when needed such as when you yourself give an application permission to use those services. You will also want to enable remote wipe if you have secure data to protect or photos you don’t want leaked. To do this you should go to Apps, Google Settings, Android Device Manager and you’ll see it and some other fun options in there. Enable over Data and Wireless! For each random place you may have noticed settings like Enable Over Wireless Only. This is great to save on your data plan but if your phone is lost or stolen you will need it to call out for help when it’s not connected to wireless so I do not recommend the enable over wireless only option as a crook or thief may not ever connect to a wireless network. They aren’t that smart after all and their stupidity could keep your phone from sending out a distress signal so be sure to allow it to work over the data 4G plan as well as wireless. Again, I recommend NOT setting it to over wireless only. Enable data reporting. 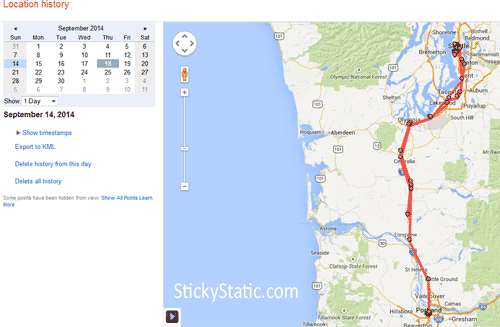 Another cool options provided by Google is to track your location history of your Android Phone. This however doesn’t seem to be turned on by default. I had to go enable mine. But then again I may have turned it off myself long ago? It’s best to check and make sure it’s on or off for you anyways depending on what you want. For this one you open Google Maps on your phone, go to Settings > Google Location Settings and check the box to enable and turn on Location Reporting for this device and turn on Location History. This page on Google tells you how to do it on several versions of the Android OS. One drawback to this option is that it may not be live time location but you can figure out history and patterns such as where they live, work or catch public transportation and then hunt them down yourself(not recommended) or tell the police when you’ve found them. Because there is one thing that the Google service does lack, being able to snap a picture remotely, the best you can do is automated photo upload with Google Photos / Picasa / Google+. That line is all so blurry right now but just get the Google+ Photo App and in settings enable auto backup. They will be set to private by default. You can also use a free service like DropBox. Once you sign up for DropBox and get the app installed on your phone there is an option to Enable Camera Upload. Again be sure to enable over data and wireless. That will upload every time a photo is taken so if the thief or person who found your phone takes a photo of themselves you will know exactly who they are. You may think that’s silly and who would do that, but it has happened many times already. Criminals are dumb and don’t understand the technology they steal from you. They just want to sell it. This might sound scary but as long as you’re not a spy or out doing illegal stuff, who cares if “they” know where you’ve been? “They” know where you’ve been even if you don’t “allow” it and log in to see the really cool reports so you might as well just enable it and have access to the data yourself. They already have it. I like being able to always find my phone. If they can, I should be able to too. Plus it could end up being an alibi some day when the man with one arm tries to frame you! Or maybe the NSA is in your histories tracking your locations so they can commit a crime in that area and blame you? I lost my Le2 mobile. My photos account is working and uploading the photos clicked by the person. I have the photo of that person. Also I have the location. What should I do now? Or text them photos of themselves and location saying you are going to call the police and for them to meet you in a public place and give you back your phone. Ultimately, whatever you do, we are not held responsible lol. I have lost my Samsung S7 Edge and yes location was turned off. Is there a way I can remotely turn it on? Or any other suggestion or solution? Thanks. I am in the same boat, location services off and cannot find my phone. Any solutions yet? Did you guys ever find this out?